Paul (Josh Stewart) and Adrienne (Jamie-Lynn Sigler) are a couple of love birds on a road trip to Los Angeles for a friend’s wedding. Frank (Chris Browning) and Sandy (Angela Featherstone) are a married couple who are having some serious, serious problems. These four people will meet, kind of… sort of… in movie that I think can best be described as a supernatural thriller called ‘Beneath the Dark’. So Paul is driving down the street on this pitch black night and Adrienne is feeling a little randy which usually doesn’t mix well with driving down poorly lit streets in the dead of night at high speeds. As one might expect, since Paul was trying to reciprocate some love while driving at high speeds, these crazy kids almost crash and die but fortunately they right the ship and decide to stop at a nearby motel to get nasty and get some sleep. The strange thing about Frank is that on one hand he’s a goofy security guard at a clothing store, but yet he’s also the weird desk clerk of this motel that Paul and Adrienne have gotten a room at. His wife Sandy on one hand is the slutty barfly who absolutely hates her husband, but she’s also wandering around aimlessly on the grounds of this motel floating in and out of rooms. What in the world is going on? Regardless, Paul and Adrienne get down to the business of getting busy but Paul is having some male issues. It happens, you know? Especially the older you get. Damn. Get off my back! Pissed off about his performance issues, Paul retreats to the diner of this joint for some coffee where he observes the world’s most obnoxious juke box which plays only one lousy sound, deals with the overly weird Frank one more time and then meets The Stranger (Afemo Omilami). This stranger seems to know things about Paul that he has no business knowing which understandably freaks Paul out, so he leaves the stranger and heads back to the motel room to deal with his unsatisfied, super horny girlfriend. Frank the Security Guard has just gotten himself fired from his job, in a most unfortunate way, which means he’s going to be home a little early. Frank’s bad day is going to get much worse when he gets home. Back at the motel, Paul’s weird day gets a lot weirder as he is starting to hallucinate and completely freak out which in turn is freaking out his girlfriend, plus he’s starting to see Sandy the slutty wife floating in and out his hotel room. It’s looking like Paul’s past is coming back to haunt him, which is probably why he’s so nervous about going to this wedding, which probably explains why he’s having some male performance issues. But what happened in this past of his and what in the world does the slutty barfly of a wife have to do with any of this? All will be explained. Only to get real confusing again. 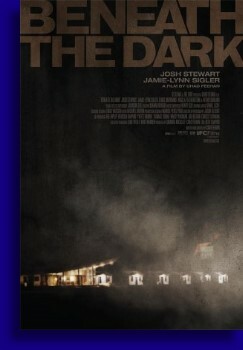 One of the things that Chad Feehan’s film ‘Beneath the Dark’, originally titled ‘Wake’ has working against it, at least from my vantage point, is that I had seen the film ‘Farmhouse’ not too long ago and while the subject matter of the two films aren’t all that similar, ‘Farmhouse’ being a torture horror film and this being more of a deep thinking spiritual thriller, the setups are almost identical. The drawback is that the big reveal wasn’t all that revealing since I had pretty good idea what was going on. I’m not sure I would’ve known this right off the bat if I hadn’t seen ‘Farmhouse’ first. Probably, but who knows? That aside, the bulk of the movie, once Paul and Adrienne make it to the motel, is pretty interesting. Because of the way things were playing out we had a good idea what was going to happen with Frank and Sandy in one of our realities, with the mystery being what, if anything, it had to do with Paul. The way that Feehan was able to weave that part of the plot into the story and the way it related to the overall timeline was also cleverly handled, so while we were pretty certain we knew how our heroes got to the motel in the first place, this part story kept us off balance. But just as everything was wrapping itself up and it all seemed pretty clear what’s going on and how the situation was about to be resolved, the final two minutes or so throws everything in a tizzy. At least for me it did. Without spoiling anything this is the point where things got a little too spiritual and esoteric for me to comprehend. It’s seems like the movie logically ended at one point and then had a fresh new confusing ending tacked on two minutes later. But then I’m not the brightest bulb in the box so take it with a grain of salt. Overall I did enjoy the majority of ‘Beneath the Dark’ though it did seem to get a little clever for its own good as it was nearing its conclusion.